Below-grade systems are constructed in original soil with distribution of effluent occurring below the soil surface. In below-grade systems, the soil treatment area is designed and installed such that the infiltrative surface is below the original ground elevation and a final cover of topsoil stabilizes the completed installation, supports vegetative growth, and sheds runoff. The underlying soil treats the many harmful components in the effluent before it reaches the surface or groundwater. The two types of below-grade soil treatment systems commonly used are trenches and seepage beds. Generally these distribution systems have pretreatment prior in a septic tank but could also follow advanced treatment units such as aerobic treatment units or media filters. Both of these systems benefit from shallow placement to maximize the natural soil biota, oxygen levels, evaporation and nutrient uptake by vegetation. The trench is the most common of the soil treatment systems and is commonly defined as a soil treatment and dispersal system that is 36 inches or less. Trenches are longer than they are wide and are laid out along the contours of the soil. The method of distributing the septic tank effluent can be either pressure or gravity. There are a number of different configurations by which the trenches can be connected with each other and with the septic tank. A typical trench is constructed by making a level excavation 18 to 36 inches wide. The soil around and beneath the trench must be neither too coarse nor too fine. A coarse soil may not adequately filter pathogens, and a fine soil may be too tight to allow water. 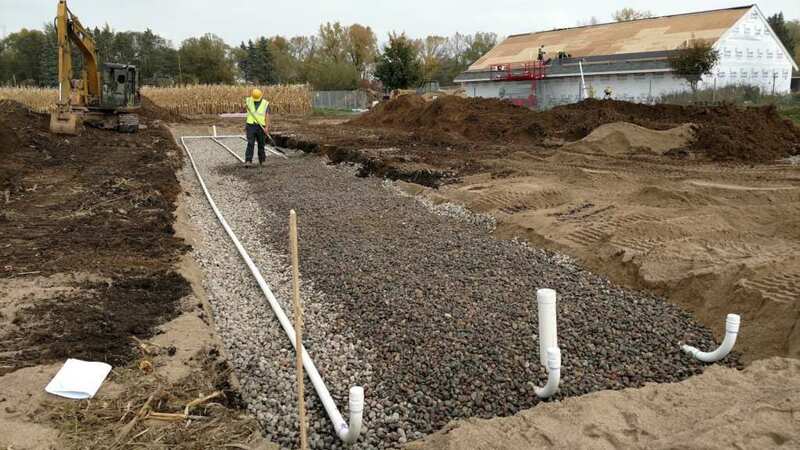 Many trench systems utilize a pipe-and-gravel distribution system where effluent passes through the pipe and is stored within the media until it can be absorbed into the soil. Very little effluent is distributed through the distribution pipe. Effluent flows through the orifices in the first length of pipe into the media and is distributed over the soil absorption area to the biomat. Other nongravel distribution media is commonly used as well. Partial treatment is achieved as effluent passes through the biomat. The biomat also distributes effluent across the soil surfaces and maintains aerobic conditions outside the trench where the remainder of the treatment occurs. A bed system is a wide area (typically wider than 3 feet) designed to accept septic tank effluent. It is installed below the surface of the soil and built the same way as a trench system. The beds treat the effluent effectively as long as they are located in appropriate soils. Beds can be designed with gravity or pressure distribution. Some jurisdictions limit the use of beds or have special sizing requirements to allow for the fact that there is very little sidewall with a seepage bed and low oxygen transfer. For these reasons, pressure distribution is recommended in beds to provide uniform distribution of effluent and re-aeration of the soil between doses. If there are restrictive soils beneath the bed (water tables, hardpans, platy or massive structure, etc. ), the contour loading rate of the bed should be lowered. This will decrease the width of the bed to minimize the potential groundwater mounding and/or down gradient seepage. Trenches have better oxygen transfer then beds and are recommended whenever the site conditions allow, although seepage beds are often more attractive due to reduced land area requirements. In addition, in terms of cost and time of construction, trenches are preferred because they have greater infiltrative surface for the same bottom area, and less damage typically occurs to the infiltrative surface during construction. Beds are more prone to problems due to reduced oxygen transfer than are trenches, as trenches have more sidewall. Therefore, narrow and longer beds are advantageous. The sidewalls are sometimes too far apart to provide sufficient oxygen for the entire seepage bed bottom area, and the biomat may increase in thickness. The thicker the biomat, the more slowly the water will leave the system. Another cause of seepage bed failure is the reduced sidewall surface area available for biological growth. Therefore, sizing of beds is critical, and designers should size beds with greater surface area than trenches receiving the same flow. Alternatively, a bed system could use pressure distribution to apply the effluent to the soil. This would allow for better transfer of oxygen.